Paris, France October 27th 2009 French courts convict six top scientologists and the scientology cult itself on charges of organized fraud and illegal exercise of pharmacy, with fines totaling close to one million US dollars. Outside the courtroom, after the convictions came down, the cult's French PR person Daniele Gounard speaks to the press with a familiar face looking on in the background. 7. 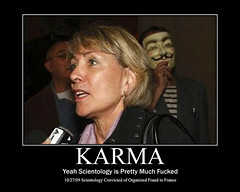 Guilty of organized fraud, Scientology Celebrity Centre - 400,000E fine. Ordered to publish judgment. 8. Guilty of organized fraud, Scientology Bookstore - 200,000E fine. Ordered to publish judgment.